Among roadside weeds near Nairobi National Park, Kenya. Dec. 2015. Disc Flowers: All the florets are small disc flowers and can be either dark lavender/pink or else almost white. 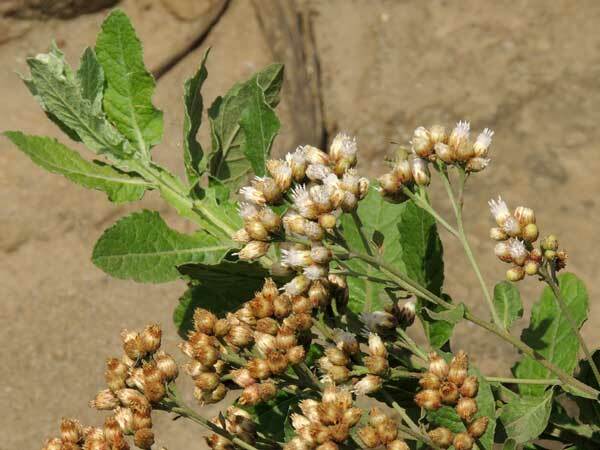 Range: This plant is reported widely from throughout Africa often in disturbed, agricultural soils. Phyllaries: The bracts enclosing the flower heads are pointed. Leaves: The elliptical leaves are coursely toothed and the blades continue down the sides of the stems making serrated wings. There are sticky glands on foliage. Annual: Long lived annual reaching almost 2 m tall.